The compact instrument for material sciences with single-molecule detection. The PL1 is a user friendly and compact device that delivers robust and stable alignment for maximum productivity and minimum downtime. 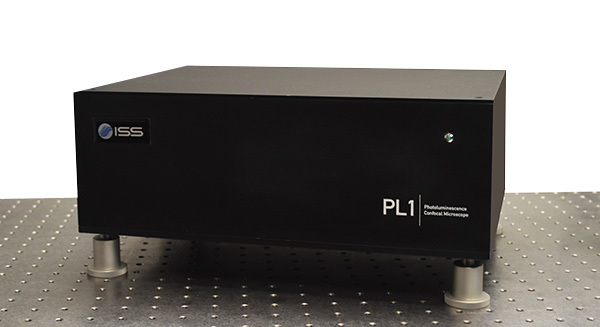 The PL1 is the ideal solution for material sciences requiring FLIM with single molecule detection sensitivity. Image Format Other than the proprietary file formats which contain the imaging parameters information, VistaVision also supports exporting the acquired data in various formats including JPEG, TIFF, PNG, and AVI. Image Processing and Analysis Visualization by various look–up tables, contrasting, thresholding, smoothing, filtering, scaling, statistical analysis by histogram or online profiling. 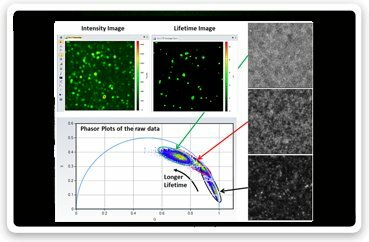 Phasor plots separate different lifetime species of quantum dots coated on the substrate directly from the raw data. Ex. 470 nm, Em. 499-632 nm (Fluorescence), 475/35 nm (Reflection), scanning area 17.5µm x 17.5µm. 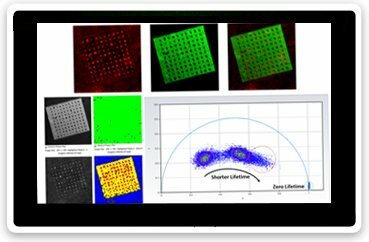 Perovskite confocal lifetime imaging for both photoluminescence intensity and lifetime at the high spatial resolution. 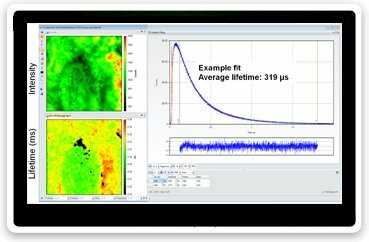 ISS VistaVision provides both the minimization fitting algorithm and the phasor plots for lifetime analysis; for example, using the multi-image phasor analysis routine, the lifetime changes in different Perovskite samples can be immediately identified by the phasor plots of their raw data sets (no fitting required), making the lifetime analysis much easier and robust. Excitation was 488 nm; emission through a 635 nm long pass filter; scanning area 20 µm x 20 µm.